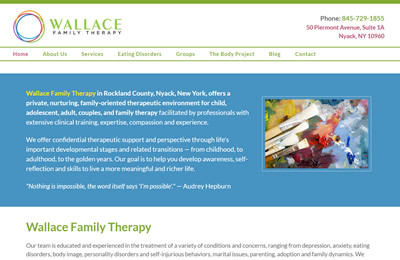 Wallace Family Therapy offers a private, nurturing, family-oriented therapeutic environment for child, adolescent, adult, couples, and family therapy in Nyack, New York. 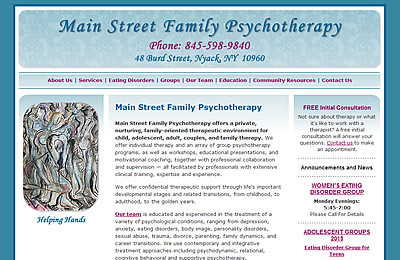 I designed and built Robin Wallace’s first Main Street Family Psychotherapy website in 2009. We did a complete redesign in 2012, which is pictured above in the “before” image. 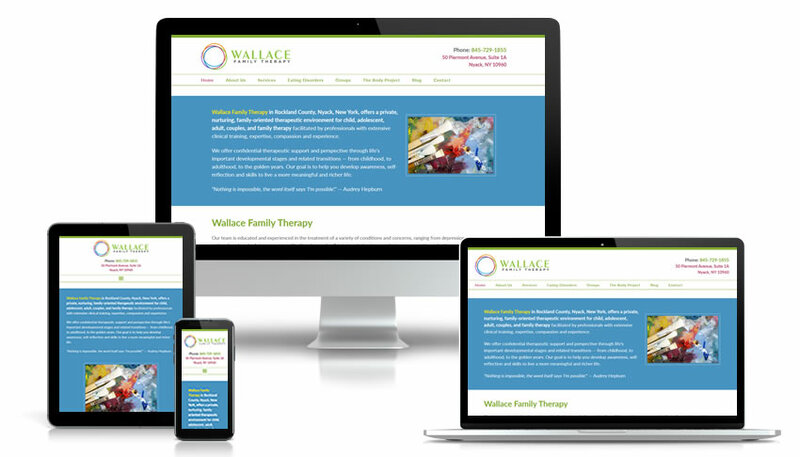 The name of her practice changed in 2016, so a complete redesign was needed to give the site a more energetic and light-hearted appearance, new content, and a mobile-responsive layout built with WordPress. In 2019, a new logo and another name change for her practice required new graphics and complementary accent colors. A variety of vibrant colors, creative images and inspirational quotes bring each section of this website and blog to life. Pages are full-width without a sidebar; blog pages have a sidebar for easy access to recent posts and categories. A call-to-action box on every page. Contact information in the header and a footer widget area that contains contact info, map and quick navigation links at the bottom of each page makes key information easy to find.